Franchising in its essence is a partnership between two entities, the franchisor and the franchisee. A franchisor is the person or a group of people who own a company, the franchisee is a person who wants to open a franchise business by using that company’s name. If the idea of starting a business from scratch is intimidating, then perhaps consider starting a franchise business. This article will highlight what exactly is franchising and why it is getting increasing popular. Support – you may need support and a sense of direction especially in the early stages of starting the business. The actual product or service that the company has. Franchisor system of doing the business, which has been proven to be a success. Training – especially if the franchisor has a certain way of providing service/product. Positive reputation – if you have chosen wisely, you will opt to choose a franchisor that has a good reputation, which will make marketing your business easier. Both parties in the agreement want to succeed and make a profit, therefore a partnership can give you a sense of security over starting a business completely without any help. There are plenty of advantages and disadvantages of a franchise business which you can read up on. In the latest report carried out by The British Franchise Association (BFA), the present is the best time to start a franchise. In terms of turnover and employment, the franchise sector is booming and seeing all-time highs. It also contributed approximately £15.1 billion to the UK economy and put around 621,000 in employment according to BFA. Spar – a convenient store, happens to be one of the oldest franchises in the UK opening in 1957. Spar has over 2,400 franchises in the UK. Costa – coffee shops seem to be popular in the franchise sector, with Costa being of the biggest names with over 15,000 franchises in the UK. Subway – is one of the biggest franchises internationally, worldwide there are 44,000 stores which are all run by franchisee’s. Business overdraft – these are easier to arrange compared to some other methods of funding, and they give a sense of security. Also, they only require you to pay interest on what you borrow. Small business loan – these loans allow you to borrow up to £25,000 for your business. Again do your research to make sure you are applying for the most suitable loans. Business credit card – this will help you keep your personal and business finances separate. Although a credit card isn’t a long-term loan, it can be helpful to have when starting up a business. The company’s image – do they have a good reputation, are they a typical household name, are they well known, will they be suitable for your area? What are their growth prospects? Location – When you are going through idea elimination process, make sure you consider the suitability of your franchise to the location you are considering. 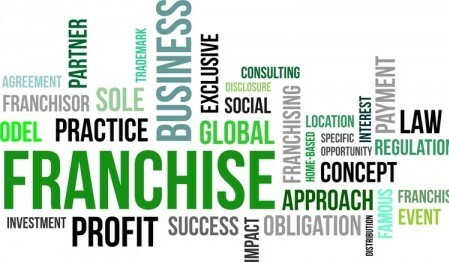 More on choosing the right franchise and types of franchising. There are definitely both pros and cons of choosing to start your business as a franchise and here they are. Support, advice, training, ready-made business model received from franchisor. A business with a good reputation will allow you to already be known. Initial and continuous fees – The initial fee may be a large sum. There are also continuous fees which will be calculated as a percentage. You are in a partnership, which means you are not completely independent. More on detailed Pros and Cons of franchising here. A franchise is an agreement or license between two legal parties which allows a person to market a product or service using the trademark of a company. A franchisee must pay a fees, which will vary depending on what kind of franchise you want to invest in. In exchange for the fees, the franchisor must provide rights and support. For more on franchising, you can take a look at the other guides in our Franchising section.